Blood levels of P24 antigen are high in the first few weeks after infection, meaning the test can detect infection in the earliest stages. 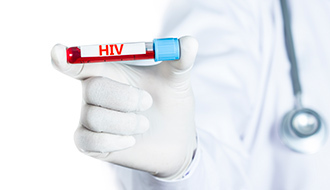 The test for HIV antibodies checks for antibodies to the virus in your blood. Antibodies are proteins that the immune system produces when it is trying to fight off an infection; different antibodies are produced to fight different infections. The HIV infection produces its own proteins, known as antigens, and the body’s antibodies are designed to fit these antigens perfectly – like a key into a lock. The antibodies bind to the antigens in a bid to destroy them, so when you have an infection trying to take hold in the body, you will also have the corresponding antibodies trying to fight it. Please arrive well-hydrated. For accuracy, the best window period for this test is 10 days to 4 weeks after infection. The P24 test is a simple blood test. A needle is inserted into a vein, usually on the inner arm near the elbow, and a small amount of blood is drawn. You may feel a pricking or scratching sensation. Confidentiality and privacy are in the core of our services. You can decide if you would like to be call or emailed with the results or if you prefer to contact the clinic yourself. If the test is taken three months or more after the possible risk of infection, a negative result is accurate. If the test is taken sooner than this, it should be repeated at a later appointment. A positive test should also be repeated in order to confirm the result. Apart from the issue of peace of mind, early detection can also help to prevent new infections of HIV. Almost half of new cases are thought to be spread by those who have been newly infected and are not aware of it. Those who have been recently infected also have much higher levels of the virus in their systems, which can make transmission more likely. What does a negative p24 test result mean? A negative result could mean that the person tested is: HIV-positive but infected before the early detection window; HIV-positive but with low levels of p24 antigen; HIV-negative.